Here in the real world, we don’t actually live with fixed budgets. I cannot stress strongly enough how we must reject this artificial limitation. If we believe we cannot increase revenues, then we will enter into the very kind of downward spiral that we’re witnessing in Portland. “Fixed budgets” mean in practice reduced budgets because costs will always grow. That in turn means cuts, and once you start cutting service, quality declines, public support declines with it, and so on. The number one thing transit advocates need to do in order to get better service is organize to overcome anti-tax ideology. That only happens by confronting it head-on and arguing that we need more money to provide better service. Anti-taxers don’t care about things like “efficiency” or “cost control,” they aren’t anti-tax because of those concerns, and even if you solved those, anti-taxers will just move the goalposts and cite something else. We need speed, frequency, and coverage. Has to be all three, though certainly not all three on the same route. Anything else will fail to generate the necessary public support to overcome the anti-taxers, and your transit system will fail like in Portland and Tacoma. And I’ll fight with you, shoulder to shoulder, to get more money for transit capital and operations. However, the reality is that we live in a state so strongly anti-tax that we as a city our county aren’t even allowed to tax ourselves past a level they’ve set and we’ve already reached. Yes, we should fight to get this level raised. But that’s beside the point. Given a new transit dollar, where’s the best place to spend it? I’d argue in a great many cases spending money to improve the speed of a line is more productive than simply adding another bus. Increase speed and you increase frequency. I really appreciate seeing both of these arguments. It’s important to recognize opportunities for funding, AND to look for ways to improve inside the funding we have now. Washington is not as anti-tax as it can seem. Voters in Puget Sound (most of the state’s electorate) approved ST2 in 2008 and voters statewide approved the gas tax increase in 2005. It’s a challenge, yes, but it is doable. Where to spend it? Obviously Seattle routes need speed and frequency increases. Suburban areas need better service too, and their votes should be rewarded. And Tacoma definitely needs our help. The key is to spend it on things that can provide a tangible improvement in the quality of life of the people we’re asking to pay for it. This is doable and winnable, but only if we focus on how to get it done. It’s not anti-tax, it’s anti-transit. It’s perfectly happy to have the money going to highways. Tell me again, did McGinn’s $60 car tab fee win at the polls? Was McGinn’s $60 fee controversial even among transit supporters? Did it do a smidgen of potholes and a smidgen of streetcars rather than focusing on one thing well? We have to do both. We have to do whatever we can to maximize our results with current funding while at the same time work with the legislature to get more funding. The 9-14 minutes of waiting for red lights on each AM RapidRide B trip equals an enormous resource, should our political leaders in Bellevue and Redmond harness the political will to turn the TSP “Priority” dial more towards the “aggressive” end of the spectrum. For the B line, it is entirely likely that an extra bus could be squeezed out of that corridor while providing faster rides for everybody along the line. This sort of thing just fills me with powerful and seething rage, but it also tempers my frustration with Metro. If the cities they serve actively prevent Metro from improving, where does the blame really belong. If we accept that we’re living in a time of constrained budgets, what then buys our separate right of way for streetcars? Or buses? Or light rail? There are lots of little things we can do, as Bruce suggested with the routes 3 & 4, to make our current transit system a little faster and a little more reliable. We should do that stuff. BUT, the big gains will only come if we’re willing to dream, design, and act big. That will mean new revenue. I agree with Will, Option 1 can’t be taken off the table. It’s true, speeding up service isn’t free. But if you double frequency alone, that’s all you get. If you double speed, you also double frequency. Also, we could have a discussion about capital vs. operations budgets. If you pay to increase frequency for a few years, that money’s spent with little to show for it afterward (see: RapidRide C). But if you pay for capital improvements to speed up a line, your speed and frequency continues well after the money’s spent. Not exactly, because you still have to allow for layovers. But if you improve apeed and reliability, maybe you can shorten the layovers too. Removing some of those car lanes. It costs money to maintain those car lanes for cars, you know. *It’s cheaper to remove them entirely*. Explain, then, why it takes closer to an hour for a rapidride A line to get from Tukwila link station to Federal Way transit center, rather than 30 minutes (like it was supposed to). The left turn onto S 316 St is excruciatingly long (it gets worse if it has to wait multiple cycles!). Also, a bunch of off-board ORCA readers are out of service, including the busy S 240 St stop serving Highline community college. Ever since the opening of the C/D lines, Metro has been sorely neglecting the A line, basically making it like a regular, non-rapidride route, the difference being that it comes every 10-15 minutes without a schedule. After reading these two posts, I have to say I view things somewhat differently (and the same as a commenter from the previous post). 1. the number one thing should be ON TIME PERFORMANCE. What I really want is a bus to be there when I expect to be (or train, or ferry, or plane, or doctor for that matter). Being able to depend onthe system getting you where you need to be when you need to be there is really what people want first I think. I don’t disagree that speed and frequency are super important, but I don’t think they capture the right focus…reliability, in my mind, does. 2. One bus away (and similar apps) have change my riding pattern quite a bit. In fact, if it were completely reliable and had universal access (which it’s getting closer…but not there yet) then the focus should be on increasing frequency…I really believe this is about perception, and a system that isn’t reliable…well, look what happen to GM, etc. It’s not just the clock time saved by not having traffic in the way. It’s the completely different experience of a bus ride with no traffic in the way. Stop-and-go driving is very hard on equipment, as well as massively wasting fuel. Every part of the machine gets extra wear. But the same goes for the humans aboard the machine, drivers and passengers alike. So I fully agree with the passenger who told me on another ride: “I’d rather the money for Rapid Ride had gone to special lanes and signals, using ordinary buses.” I really think that a lot of the negativity about this new mode comes from sense of a glitzy fake to cover inability to deliver the harder reality. Nothing against the new 3-door artics- these are exactly the buses the Downtown Seattle Transit Tunnel needs right now. The livery could bring us “wrap” revenue from Oscar Meyer, and the black seats really belong in LA, Miami, or Vegas. But sooner or later, elected officials in charge of transit have to request that we the people keep our automobiles out of the way of the transit system at the time it most needs to be fast an smooth. Resulting improvement in transit will convince many motorists to take the deal without a fight. I agree absolutely — the change in experience when they moved the 212 out of the tunnel onto surface streets was enormous. Before the move we didn’t have to contend with slow moving trucks unloading at Uwajimaya, the crawl up from 2nd avenue to 5th in th evening, and the danger of inattentive jaywalkers. Why not just give our trolleybuses the right of way right now? Why wait for streetcars? Ryan poses a key question: Seattle could treat the trolleybus as it treats its streetcars, by providing in-lane stops, faster fare collection, and signal priority. The funds needed for streetcar capital could be used to improve additional corridors or service frequency. So is someone going to chat about the big elephant in the room when it comes to the First Hill Streetcar? The elephant that involves creating exclusive lanes for bicyclists and making the streetcar mix with traffic. Bicycle tracks are a great idea — but streetcar exclusivity are almost always a better “value” for the taxpayers (improving transit productivity) as well as having higher numbers of users. We should immdtately do the same thing on westlake, but we wouldn’t even have to remove SOV acess since there are 2 lanes in each direction. Ideally though, we could put a cycle path right down the middle of westlake then you won’t have conflicts with cars that want to turn right in the streecar lanes. With a cycle path on westlake you could remove the bike lanes from 9th and add a sov lane in both direcitons by removing parking. All in all, at the cost of some on-street parking we could give all the streetcars dedicated ROW which would probably allow us to 2x the speed of the streecars (plus you could get better totally-separated bike connectivty to SLU). So on a day with lousy weather, a single vehicle chugging by every 12-15 minutes constitutes the only activity and only sets of eyes on a mile-long, 100-foot-wide street. Well, worked for Buffalo (if by “worked” you mean “killed downtown Buffalo dead”). As best as I can tell Broadway is only 50ft wide or so, that’s actually a problem given there isn’t enough space for 2 transit lanes, 2 sov lanes and 2 bike lanes. Also, if the point is to increase speed/frequency I’d expect a streetcar every 5-7.5 minutes, and plus this corridor could be used by busses as well. On top of that, Broadway has very heavy pedestrian activity despite the perennially terrible weather. I know that transit/pedestrian malls don’t always work, but I think that it’s overkill to say that 100% of the streets have to support SOV’s. Just as there are some places where bikes don’t fit, there are places (far fewer, mind you) where SOV’s don’t fit. DP is opposing transit lanes? How does he think he’s ever going to make his NonRapidRide rapid then? Those “empty” lanes say “This city is committed to effective transit.” I love the center tracks on MLK; it always makes me happy to see a street with dedicated transit lanes, even if it’s obviously wider because of them. Transit malls are death to every commercial street they were ever tried on. If dedicated transit lanes in a dense setting are desirable, make them one lane only on any street they’re located so as to maintain activity and the overall street grid. Put the other lane for the return trip on a different street. @BA: These were experiments mostly undertaken at the nadir of American cities (alternately: the apex of violent crime and suburban flight), mostly in struggling downtowns (in the 70s and 80s there was hardly any other kind) that lacked at least one important part of the mixed-use puzzle: residents. 1. Outside of America successful pedestrian commercial streets (and, in some cases, plazas and entire districts) are common. 2. Within America successful pedestrian commercial streets exist in a modified form: shopping malls. Even though most people drive to malls, it doesn’t seem to matter that they can’t see the storefronts from their cars. 3. Cap Hill and First Hill have residents in proportion to their jobs and commercial activities, which is really important for true pedestrian commercial use. Downtown Chicago in the 70s, for instance, did not (it has more residents now, but still not enough to inspire useful amenities for residents). 4. Just as in the struggling American downtowns of the 70s and 80s almost anything leaders tried was likely to fail. Cap Hill and First Hill today are in a much more favorable position. South of Madison particularly car access to Broadway might be necessary (or nearly necessary) for hospital and business access, particularly because the hospitals and Seattle U break up the street grid so much. Maybe instead of closing the entire street to car traffic, 3rd Ave-style through-traffic restrictions would be appropriate in some places. State Street in Madison, WI is a bike/transit/pedestrian mall and has tons of activity. They don’t always fail. Al D., I’m disappointed. You’re usually immune to the “Seattle can ignore precedent because we’re so awesome” disease. 1. The street/square must already be a pedestrian magnet of the highest order, before you even get started, at a people-per-square-meter ratio that will remain high even when you quadruple the allotted pedestrian space. If your sidewalks aren’t literally exploding with people multiple hours a day, you don’t have the critical mass to spread them wider without the place starting to feel barren. This is why the European examples you envision exist on very skinny streets, or at the primary crossroads used by the entire populations of towns or cities daily, or both. This is why Pike Place is successfully pedestrianized (it’s tiny, unique, and an inherent draw). This is why there are working examples in small towns with giant universities (Madison, Boulder, Burlinton, Iowa City): captive audience in walking distance, and not many other places they might go. It should be noted that all these streets, as well as Santa Monica’s 3rd Street Promenade, are much skinnier frontage-to-frontage than Broadway and pedestrianized along a much shorter corridor than you proposed. 3. The space must be visually appealing, if you want people to linger as well as to move in and out. Bad architecture is a killer. Broadway has almost no good architecture. Have you ever lingered on Broadway? What really wilts my lettuce is the repeated, fraudulent contention that pedestrian schemes have failed only in the U.S., and that this has only to do with the concurrent decline of American urban centers. The UK, which went just as nuts with the trend as we did, is replete with failed examples. Unsurprisingly, successful British examples mirror other successful European precedents (skinny streets, already-bustling centers) as well as our own college-town examples, which the myriad British failures look much like ours (wide streets, overly-planned, rendered barren). Ottawa and Calgary both have struggling pedestrian areas, in downtowns that are otherwise doing just fine thankyouverymuch, and in cities with very high transit usage. And downtown Boston, which refused to die even during “apex of violent crime” from the ’70s to the early ’90s, has only a single place where pedestrians are too sketched-out to remain after dark: Downtown Crossing, the pedestrianized zone. A block away, on Tremont, you’ll find people sitting on the park benches and dashing between the automobile through-traffic until 2 in the morning. It’s lively. A mile away on Newbury Street, pedestrians rule but autos remain, and the mix keeps everything feeling lively. But the pedestrianized zone is death, and so every shop pulls down the security grate by 7. Mike, the solution is well-understood. Keep the many eyes and mixed bustle of space activators — cars and trucks, bikes and people — interacting on the surface. Put the usable mass transit underground, where it can get you along the corridor fast (like a properly-urban Link would have done, and like the streetcars never like). If you can’t segregate the transit completely, take lanes for it, even if that means forbidding cars from left turns or strategically removing parking. Certainly do not submit to mixed-traffic transit running like that will solve anything. But also do not pretend that barren “transit malls” will do anything but kill your urban vibrancy. Quiet is not the new loud. d.p. : it basically did work for Buffalo. The whole of Buffalo is dead, but downtown is doing slightly better than the rest of it. You have to put it in the context of the complete economic disaster which hit Buffalo. To expand on what I was saying, I agree entirely with your description of what is needed for pedestrian malls to work in general. My point is that there is nowhere in the whole of Buffalo with enough traffic of any sort, pedestrian, bicycle, bus, *or* automobile, to make it vibrant in any way. Given that, the places with the train stops are doing noticeably better than the places without. Buffalo’s got some issues, but it’s not Detroit, or even Rochester. And downtown may be better off than elsewhere, but that pedestrian/trolley mall is specifically and conspicuously desolate. 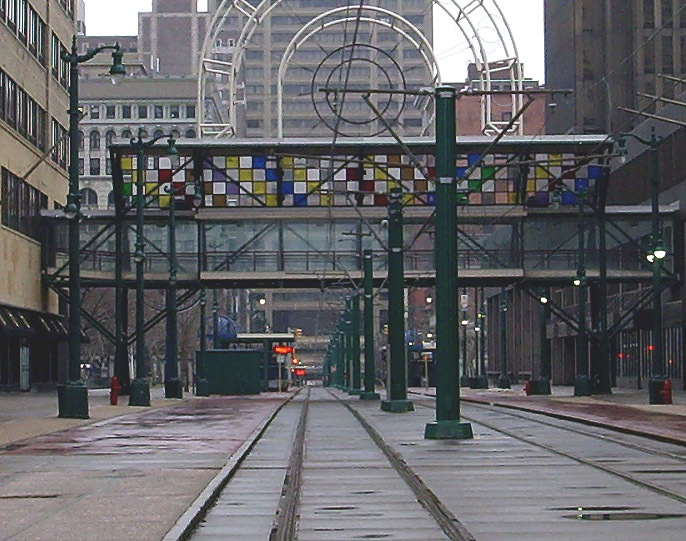 It should be noted that there are finally talks to expand upon the Buffalo Metro’s puny stub line (with, amazingly, ridership not much worse than Seattle’s existing line), just as it should be noted that these talks are concurrent with the ongoing reopening of the transit mall to mixed traffic. I’m as baffled as you as to why they’d want to reintroduce mixed traffic in mixed lanes — the street is wide, and there would have been plenty of room to do it correctly. But the recognition that a place with bustle is a place to which people might actually want to take transit is spot-on. One reason for the separated cycletrack is that streetcars and cars go at the same speed, while bicycles are an order of magnitude slower. Also if a car hits a streetcar both will be dented, but if a car hits a bicyclist the bicyclist will die. The slower the car, the lower the likelihood of death, Mike. Here’s a source about the likelihood of pedestrian fatalities and speed. I would also point out that there are lots of vehicles and bicyclists who make right and left turns onto and off of Broadway and a cycle track doesn’t really help that danger. The cycle track will probably make it harder for drivers to see a bicyclist if they are behind a streetcar or if the bicyclist and driver are going in the same direction and one turns. Finally, streetcars require much longer stopping distances than autos do, so they are more dangerous to cut off if one is a bicyclist. Checking out the 2011 accident report on page 3-8 of the SDOT 2011 traffic report shows one collision on the segment of Broadway where the cycle track is now under construction. Meanwhile, the much flatter 12th Avenue has many more collisions. From a safety perspective, it looks like 12th Avenue would have been the better cycle track corridor. Matt’s name was just mentioned a couple of minutes ago on KIRO radio by Luke Burbank. He’s talking about the gondola idea. And is top of page at Seattle Times online. And don’t forget to take today’s poll. Gondolas are up 53% to 43%. Despite the hudreds of negative comments on the original story. Ignore all Seattle Times comments. We’d have the death penalty for any gross misdemeanor or felony. Government would consist only of the military and roadbuilding. Public employees (the few left) would not be allowed to vote or paid more than a Subway sandwich artist. All nonwhite people would be excluded from the state of Washington.